Okay, it’s confession time. I work a lot. As a chef, it’s not unusual to find me in the kitchen 6 or 7 nights a week, and truly rare is the day that goes by without me in the kitchen at all. So it was a pleasure to be able to sneak away one night a couple of months ago to join friends for dinner. Yep. Like I said, I work a lot and as much as I love to share, sometimes things get pushed back. I told you all that to tell you this… the friends that were able to join us that night live on the Westside, so using Jonathan Gold’s 101 Best Restaurants in Los Angeles as a guide, I chose Rustic Canyon on Wilshire Boulevard in Santa Monica. Mr. Gold had written a great review about the food at Rustic Canyon and the Chef, Jeremy Fox. One thing that intrigued me was how Gold elaborated that Fox isn’t interested in celebrity, just providing great food, atmosphere and service. He likes Rustic Canyon so much, he ranked it #5 out of his top 101 restaurants to visit. With that in mind, our trip to Santa Monica was exciting and I’d like to share the night in both words and pictures. I started my evening with a cocktail. When it comes to adult beverages, I usually have a beer, like a Belgian Saison. But, nights out like this don’t happen often, so I decided to try one of Rustic Canyon Signature drinks, the Angelino. Served in a small champagne coupe, this mixture of Rye, Vermouth, Grand Poppy Liqueur and Orange Bitters was served ice cold with a wide strip of orange zest as a garnish. The drink had a nice combination of grain and herbs from the Rye and Vermouth, with citrus notes from the Bitters and Liqueur. I found that the size of the cocktail served as a great starter to the meal. In fact, I was planning on having a beer with my main course, but decided against it after one Angelino. I sipped the Angelino while we shared the Marcona Almonds with Lavender. Ever since I worked and lived in Barcelona, I have become an almond fanatic. Marconas are sensational, completely different from any Almond you have ever tasted. The Lavender was subtle and not overpowering. It’s always a pleasure to have something as simple as a roasted almond seasoned with such care. The four of us decided to share some appetizers, starting with some Beets, wonderfully cooked then mixed with some Blackberries, Quinoa, Avocado and Pistachios. I have always liked Beets, especially baby ones. My father raised a vegetable garden when I was a teenager and we really enjoyed the fruits of his labors. Beets were one of those vegetables. The earthy quality of the Beet was paired nicely with the sweet and slightly tart flavor of the Blackberry. The nutty quality of the Quinoa paired well with the Pistachios and then there was a little avocado to give the dish a rich creamy flavor. One of us (not me!) said that they don’t usually like Beets, but with the Blackberries, it was very good. Next were the Spring Peas. Perhaps they were obtained from the Wednesday Farmers Market in Santa Monica. These are one of my absolute favorite vegetables, a portent of the growing season and care in harvesting – especially with the challenging weather this year. Delicate and sweet, peas need to be prepared and eaten as soon after picking as possible. The Peas were served in a bowl small dollops of a Pecorino Custard. The idea of a savory custard is always exciting, especially when you know that a classic sauce like Hollandaise is basically that, a savory Custard. The Pecorino may have been made like a Hollandaise, or it may have been more like a Mayonnaise. It was very thick like a Mayonnaise, and the Pecorino flavor was not overpowering, just enough to give the peas a little richness. Mint and Red Wine Vinegar were also used, giving the peas a different sweetness and acidity. Lastly, some Pea Shoots were used to garnish the dish. One vegetable I always envision eating in the garden, straight from the vine! Roasted White Yams were next. Nicely caramelized and slightly crunchy on the outside and creamy on the inside. They were served with Green Garlic Butter, Celery, Hazelnut Dukkah and Aioli. As with the other dishes, the attention to detail and seasoning was top notch. I got just a hint of the Green Garlic Butter and Garlic from the Aioli, but not enough to be overpowering. The Celery and Dukkah added a nice crunch and spice. For those of you who don’t know, Dukkah is a nut and spice blend commonly used in Egypt. Hazelnuts, Sesame Seeds, Coriander and Cumin are commonly used, but like the Indian Spice blend Garam Marsala, you will find many different versions. Next I had a roasted half Chicken, Potato Puree and Sugar Snap Peas. Nice crispy skin and simply seasoned. The Puree was very smooth, creamy. Very decadent way to have Potatoes. I’m Irish and I love potatoes this way, but can’t have them all the time. Not with all that butter and cream! A few quickly sautéed peas garnished the top. Even though I had those wonderful Spring Peas earlier, I didn’t mind having more! What I didn’t see listed in the menu and truly loved was the jus. A simple sauce made from the drippings from the chicken. Nothing better to mix with those potatoes! My wife had the Pork Chop, which to her great surprise came sliced and fanned out on her plate. The Strawberry-Pine Nut Sofrito is an interesting take on the classic Spanish mixture of Red Bell Peppers, Onions, Tomatoes and Garlic. Fruit and Pork are always a good combination and the sweetness of the Strawberries and the softened texture of the cooked nuts was a welcome addition to the dish. A Salsa Verde was part of the presentation. All of this sitting atop a nice helping of creamy Polenta. Our friends had a Poached Trout. For me, fish always tastes better when paired with another meat and this dish was served with a broth made from smoked ham. Nappa cabbage and more peas (it is that time of year!) made this dish very flavorful indeed. What was very different was that the fish was poached and served with the skin on. You don’t see that very often, because the skin gets chewy. But the portion size of the fish was small, perhaps the filet came from a young fish. Dessert was a great way to end our evening. My wife had a sweet and tart Blood Orange Sorbet. Simply scooped onto her dish. No other garnishes or accompaniments. I had the largest slice of homemade Brioche that I have ever had. It came on a pool of Dulce De Leche Caramel with a little Salt. A little Ganache over the top of the bread and that is a dessert for someone running a marathon the next day. I only ate half of it, but I have to confess that the rest of it found its way into my stomach later that night! Our friends had the flourless chocolate cake, which was studded with hazelnuts and carob chips. A little whipped cream to top it off. Nothing like Hazelnuts and Chocolate, a classic combination! 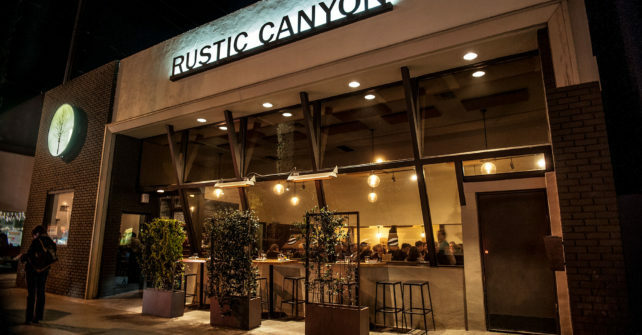 If you are in Santa Monica and want to have a really well prepared, farmers-market-driven dinner, head to the Rustic Canyon. Chef Eric is a phenomenal chef and instructor. The Master Chef class has been informative, inspiring, and above all, fun! The confidence I have in myself as a chef has improved alongside my skills, and for that I have Chef Eric to thank. I am so glad I took this course and look forward to learning more skills through Chef Eric’s other courses.